Joys of Caravanning - My Caravan History. 5th Trip in Europe 2008. 6th Trip in Europe 2009. 7th Trip in Europe 2010. 8th Trip to Europe 2011. 8th Trip 2011 Part 2. 9th Trip to Europe 2012. 9th Trip 2012. Part 2. 13th Trip tp Europe 2016. 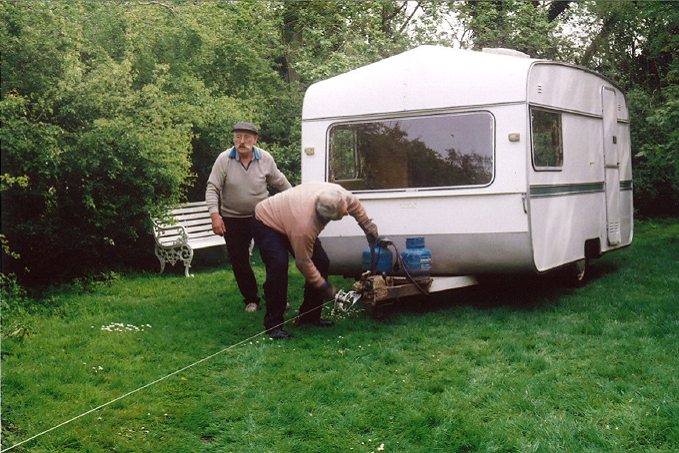 My husband, John, and I started caravanning in 1970 when we bought our first caravan a second hand, Sprite 400 from Cambridge Caravans, in Cambridge. Not sure what year the caravan was but I know the actual date we put deposit on the van on 9th January 1971 and was for £5.4s.0p. The van was £245. The Insurance was £1.10s.0p. 2 gas bottles, regulator and hose was £11.15s.0p. Number Plate was 10 shillings Total of bill was £253.10.0. Picked it up a week later. We, together with our children Karen then 11 years old and Nigel 9, enjoyed many happy weekends and holidays in it even though, we did not have all the mod cons of today, like an inside toilet and washing area, just a tent outside with an Elsan in it. I can tell you it was very eerie and sometimes cold visiting there in the middle of the night. Daily washing, cleaning teeth and washing hair etc:- had to be done at the kitchen sink as not many toilets and shower blocks in those days. In 1972, on a trip to Felixstowe, for the weekend, we needed a new water carrier so drove to Michael Elmer Caravans in Ipswich to purchase one. But came back to the van later with not only the carrier but having paid a deposit on a brand new Lunar 4 berth caravan. 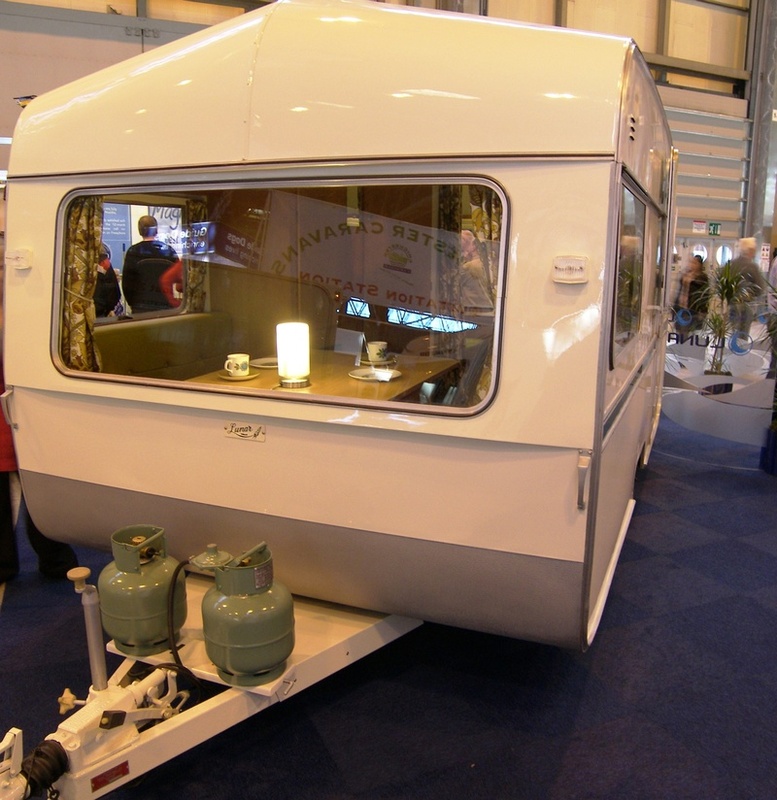 This was one of the first models that Lunar built, after their owners broke away from Knowsley Caravans and started up on their own. What luxury, an inside toilet and washbasin compartment, plush lime green velour upholstery, toning floral curtains, with toning striped fitted carpet. No oven so another Radford had to be bought and fitted. Before the days of the Lunar, we had friends in Mildenhall who had a Sprite 400 too and as they had a Post Office business could not get away for weekends so we use to take the vans out on a Sunday for the day to Grimes Graves just in Norfolk. A lot of fun use to be had especially the four children together. Maurice and Maureen had two boys Dean and Graham. A few years on Maurice and Maureen started a little business, from their home, hiring out mobile caravans which later developed into M & M Leisure of Mildenhall in 1976 and another branch at Haverhill later on. Both are thriveing businesses today Mildenhall run by son Dean and Haverhill by son Graham after the death of Maurice in 1998. Today we hear, with great sadness, that M&M Leisure (Mildenhall) is to cease trading on the 16th September due to Deans Health Issues. Sadly Dean died suddendly in 2012. Needless to say, we have bought all our caravans from M & M since it was formed. 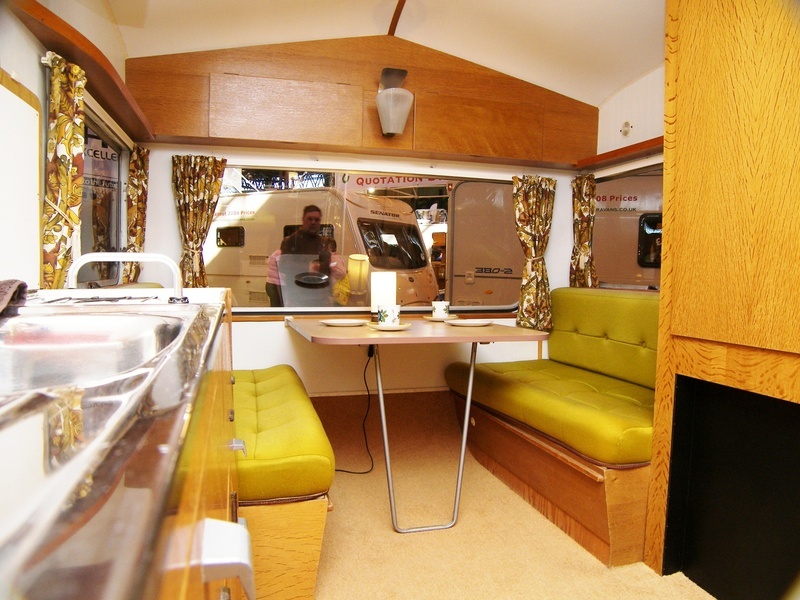 The first being a 2nd hand Avondale Sandpiper then a series of three Ace Awards and an Elddis. We then had a break for some years when we bought a cruiser on the River Ouse that we used for a few years until a friend gave us a static caravan on the Suffolk Coast. 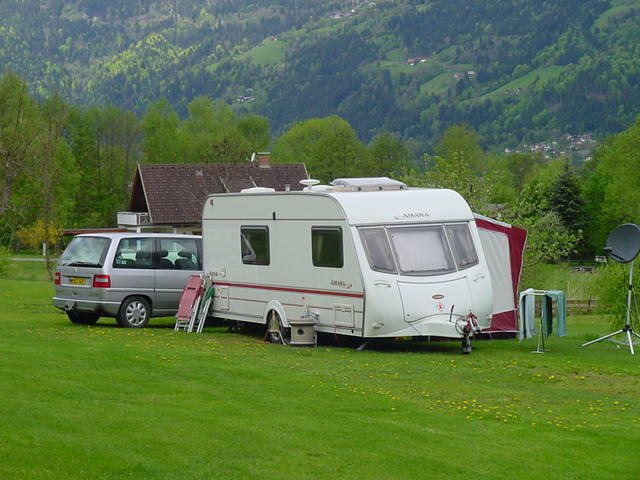 We enjoyed this very much and wanted to try caravanning in Europe so together with the Daughter and Son in Law we bought a Bailey Moselle with the intention of us going to Europe in the spring as we were now retired, and Karen and Bill using it in the summer in the UK. They used it once or twice and then, disaster struck, when in December 2002 the van was stolen from the side of our house. Later in August 2003 we decided to sell the static van and went off to M & M's to buy ourselves a tourer. We invested in a brand new. 2003 model Coachman Amara 520/4 and set off in March 2004 on our first tour into Europe for 9 weeks. Details of this and subsequent tours you will find in my other pages Trips in Europe. In early 2007 we were off to M & M's again to exchange the Amara for our existing one a 2005 Elddis Crusader Storm which we tow with a Kia Sorento XS Automatic. We really love and enjoy both it is a perfect combination for us. After scanning some old slides I found a photo of the actual caravan below. This is a photo taken of a Sprite 400 (European Specs) in Slovakia in 2008. It gives you an idea what it was like and how small our first van was. Four of us use to live, sleep and eat in this. This is a photo of a Lunar Venus Mk11. 1972 same as ours was. This photo was sent to me and published by permission of Lunar Caravans as I have no photo's of ours. More Photo's of Lunar Venus. These last two photo's were sent to me by email and are printed by permission of Andrew Jenkinson, for which I am most grateful. Photo's of Avondale Sandpiper 1975 same model as ours. I have just found these slide photo's of our first three caravans. Put on November 2011. First van Sprite 400. Our Second Van Lunar Venus Mk 11 1972. Third Van Avondale Sandpiper. Taken at Onich CC Site in Scotland. Just found colour slides of our first three vans so have scanned and added them in November 2011. These Photo's were kindly sent to me by carl1 on the Caravan Talk Forum. For which I thank him very much. Old Photo's. Taken on Wales CL notice the Lamb who kept visiting us. Next two Photo's taken at the Covet Caravan Club Site, Norfolk. Think it must have been cold. This is an Elddis Caravan and Volvo 360 GLT I have just found a photo of in 2019. Current Caravan in 2010. 2005 Elddis Crusader Storm. 4 Berth. Caravan pitched with just Canopy fitted. Pitched with Porch Awning with New Canopy attached we had made for us. Current Caravan at Jodl Camping Ossiachersee what a wonderful situation and view. Always have the same pitch. Now after 11 years of getting back to caravanning we have completed 11 Tours in Europe. We have so enjoyed these some longer than others. We have visited 14 Countries. We now know our favourites which in order are Austria, Germany, Holland, Italy. The latter we have not been to for a few years as it has become quite expensive. We were given a thin booklet on a site in Italy the first year we went to Europe in 2004 containing a Card for Discount on some Sites, this was the first ACSI Camping Card. What a find that was it has saved us lots of money over the years and we have not found a dud site yet. We now look forward to our 12th trip in April which will be logged on here as all other years.